1 Used Swiss area code 41 75 until 1999. The Principality of Liechtenstein (German: Fürstentum Liechtenstein) is a small, doubly landlocked country in Central Europe, bordered by Switzerland to its west and by Austria to its east. Mountainous, it is a winter sports resort, though it is perhaps best-known as a tax haven. Despite this, it is not heavily urbanized (like the Principality of Monaco or Gibraltar) but many cultivated fields and little farms characterize its landscape both in the north (Unterland) and in the south (Oberland). It is the smallest German-speaking country in the world. At one time, the territory of Liechtenstein formed a part (albeit a diminutive one) of the ancient Roman province of Raetia. For centuries this territory, geographically removed from European strategic interests, had little impact on the tide of European history. Prior to the reign of its current dynasty, the region was enfiefed to a line of the counts of Hohenems. The Liechtenstein dynasty, from which the Principality takes its name (rather than vice-versa), comes from Castle Liechtenstein in faraway Lower Austria, which the family possessed from at least 1140 to the 13th century, and from 1807 onwards. Through the centuries, the dynasty acquired vast swathes of land, predominantly in Moravia, Lower Austria, Silesia and Styria, though in all cases, these territories were held in fief under other more senior feudal lords, particularly under various lines of the Habsburg family, to whom several Liechtenstein princes served as close advisors. Thus, and without any territory held directly under the Imperial throne, the Liechtenstein dynasty was unable to meet a primary requirement to qualify for a seat in the Imperial diet, the Reichstag. The family yearned greatly for the added power which a seat in the Imperial government would garner, and therefore searched for lands to acquire which would be unmittelbar or held without any feudal personage other than the Holy Roman Emperor himself having rights on the land. After some time, the family was able to arrange the purchase of the minuscule Herrschaft ("Lordship") of Schellenberg and countship of Vaduz (in 1699 and 1712 respectively) from the Hohenems. Tiny Schellenberg and Vaduz possessed exactly the political status required, no feudal lord other than their comital sovereign and the suzerain Emperor. Thereby, on January 23, 1719, after purchase had been duly made, Charles VI, Holy Roman Emperor decreed Vaduz and Schellenberg were united, and raised to the dignity of Fürstentum (principality) with the name "Liechtenstein" in honour of "[his] true servant, Anton Florian of Liechtenstein". It is on this date that Liechtenstein became a sovereign member state of the Holy Roman Empire. Ironically, but as testament to the pure political expediency of the purchases, the Princes of Liechtenstein did not set foot in their new principality for several decades. Schloss Vaduz, overlooking the capital, is still home to the Princes of Liechtenstein. In 1806, most of the Holy Roman Empire was invaded by Napoleon I of the First French Empire. This event had broad consequences for Liechtenstein: imperial legal and political mechanisms broke down, while Francis II, Holy Roman Emperor abdicated the imperial throne: the Empire itself dissolved. As a result, Liechtenstein ceased to have any obligations to any feudal lord beyond its borders. Modern publications generally (although incorrectly) attribute Liechtenstein's sovereignty to these events. In reality, its prince merely became suzerain as well as remaining sovereign lord. From 25 July 1806 when the Confederation of the Rhine was founded, the prince of Liechtenstein was a member, in fact a vassal of its hegemon styled protector, French Emperor Napoleon I Bonaparte, until the dissolution of the Confederation on 19 October 1813. Soon after, Liechtenstein joined the German Confederation ( 20 June 1815 – 24 August 1866, presided by the Emperor of Austria). Until the end of World War I, Liechtenstein was closely tied first to the Austrian Empire and then to Austria-Hungary. However, the economic devastation caused by WWI forced the country to conclude a customs and monetary union with its other neighbour, Switzerland. The Army was disbanded already in 1868, out of financial considerations. At the time of the dissolution of the Austro-Hungarian Empire, it was argued that Liechteinstein as a fief of the Holy Roman Empire (supposedly still incarnated in Liechtensteiner eyes at an abstract level in the person of the then-destitutued Austro-Hungarian Emperor, despite its formal dissolution in 1806) was no longer bound to Austria, then emerging as an independent state which did not consider itself as the legal successor to the Empire. Liechtenstein is thus the last independent state in Europe which can claim an element of continuity from the Holy Roman Empire. 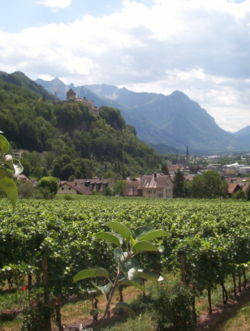 The Prince of Liechtenstein owns vineyards in Vaduz (in the foreground). During World War II, Liechtenstein remained neutral, while family treasures within the war zone were brought to Liechtenstein (and London) for safekeeping. At the close of the conflict, Czechoslovakia and Poland, acting to seize what they considered to be German possessions, expropriated the entirety of the Liechtenstein dynasty's hereditary lands and possessions in Bohemia, Moravia and Silesia — the Princes of Liechtenstein lived in Vienna until the Anschluss of 1938. The expropriations (subject to modern legal dispute at the World Court) included over 1,600 square kilometres (600 sq. mi) of agricultural and forest land, including also several family castles and palaces. It is thus little wonder that during the decades of the Cold War, citizens of Liechtenstein were forbidden by Czechoslovakia from even entering that country. Liechtenstein gave asylum to approximately 500 Russian Soldiers at the close of World War II; this is depicted in a monument at the border town of Hinterschellenberg. See Russian Monument Liechtenstein, and is marked on the country's tourist map. In dire financial straits following the war, the Liechtenstein dynasty often resorted to selling family artistic treasures, including for instance the priceless portrait " Ginevra de' Benci" by Leonardo da Vinci, which was purchased by the National Gallery of Art of the United States in 1967. However, the economic condition of Liechtenstein improved rapidly. During the decades following, Liechtenstein prospered, its economy modernizing with the advantage of low corporate tax rates which drew many companies to the country. The Prince of Liechtenstein is the world's 5th wealthiest head-of-state, with an estimated wealth of 4 billion dollars. The country's population enjoys one of the world's highest standards of living. Liechtenstein is situated in the Upper Rhine valley of the European Alps. The entire western border of Liechtenstein is formed by the river. Measured north to south, the country is only about 15 miles (24 km) long. In its east, Liechtenstein rises to higher altitudes; its highest point, the Grauspitz, reaches 2,599 metres (8,527 ft). Despite its alpine location, prevailing southerly winds make the climate of Liechtenstein rather mild. In winter, the mountain slopes are well suited to winter sports. Liechtenstein is one of only two doubly landlocked countries in the world; i.e., a landlocked country surrounded by other landlocked countries. The other is Uzbekistan. It is the only country with a predominantly German-speaking population that does not share a border with the Federal Republic of Germany. Looking northward at Vaduz city-centre. Despite its small geographic area and limited natural resources, Liechtenstein is currently the only country in the world with more registered companies than citizens, it has developed into a prosperous, highly industrialized, free-enterprise economy, and boasts a financial service sector and also living standard which compare favourably to those of the urban areas of Liechtenstein's large European neighbours. Advantageously low business taxes — the maximum tax rate is 18% — as well as easy Rules of Incorporation have induced about 73,700 holding (or so-called 'letter box') companies to establish nominal offices in Liechtenstein. Such processes provide about 30% of Liechtenstein's state revenue. Recently, Liechtenstein has shown strong determination to dispel the country's unhelpful image as a centre for international money-laundering. Liechtenstein participates in a customs union with Switzerland and employs the Swiss franc as national currency. The country imports more than 90% of its energy requirements. Liechtenstein has been a member of the European Economic Area (an organization serving as a bridge between the European Free Trade Association (EFTA) and the European Union) since May 1995. The government is working to harmonize its economic policies with those of an integrated Europe. Since 2002, Liechtenstein's rate of unemployment has doubled, although it stood at only 2.2% in the third quarter of 2004. Currently, there is only one hospital in Liechtenstein, the Liechtensteinisches Landesspital in Vaduz. The GDP (PPP) is $1.786 billion and $54,000 per person. Liechtenstein's most recognizable international company, and largest employer is Hilti, a manufacturer of concrete fastening systems. Liechtenstein is also the home of the Curta calculator. 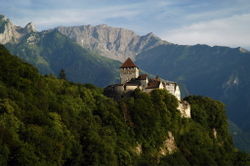 Liechtenstein is the fourth smallest country of Europe, after the Vatican City, Monaco and San Marino. Its population is primarily ethnic Alemannic, though its resident population is approximately one third foreign-born, primarily Germans from the Federal Republic of Germany, Austria, and the Swiss Confederation, other ( Latin) Swiss, Italians and Turks. Foreigners make up two-thirds of the country's workforce. Nationals are reffered to by the plural: Liechtensteiners. The official language is German; most speak Alemannic, a highly divergent dialect of German (see Middle High German). About 76% of the population adhere to the Roman Catholic faith, while about 7% are Protestant, the remaining 17% are agnostic, atheist or belonging to one of the country's minority religions like Islam, Hinduism and Judaism. 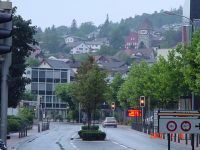 On November 27, 2005, Liechtenstein voters rejected an initiative that would prohibit abortion, artificial birth control, and living wills in the principality. Instead, a government-sponsored counterproposal, relativizing differences and still allowing them to be prohibited phenomena, was ratified with a scarce majority. The anti-abortion (pro-life) initiative was supported by Roman Catholic Archbishop Wolfgang Haas. Hereditary Prince Alois was initially sympathetic to the anti-abortion proposal, but became neutral during the run-up to the vote. There are about 250 kilometres (155 mi) of paved roadway within Liechtenstein, and 9.5 kilometres (5.9 mi) of railway. The country's rails are administered by the Austrian Federal Railways as part of the route between Feldkirch, Austria, and Buchs SG, Switzerland. Four stations in Liechtenstein, including Schaan-Vaduz, Forst Hilti, Nendeln, and Schaanwald, are served by an irregular stopping-train service running between Feldkirch and Buchs. While EuroCity and other long distance international trains also make use of the route, these do not call at Liechtenstein stations. Liechtenstein Bus is a subsidiary of the Swiss Postbus system, and connects to the Swiss bus network at Buchs SG and at Sargans as well as the Austrian city of Feldkirch. Due to Liechtenstein's small size, the country has been strongly affected by external cultural influences, most notably those originating in the southern German-speaking areas of Europe, including Austria, Bavaria, Switzerland, and the Tyrol. The Historical Society of the Principality of Liechtenstein plays a role in preserving the culture and history of the country. Liechtenstein football teams play in the Swiss football leagues. The Liechtenstein Cup allows access to one Liechtenstein team each year in the UEFA Cup; FC Vaduz, a team playing in the Swiss Challenge League (i.e. the second level of Swiss football) is the most successful team in the Cup, and scored their greatest success in the European Cup Winners' Cup in 1996 when they defeated the Latvian team FC Universitate Riga by 1–1 and 4–2, to go on to a lucrative fixture against Paris St Germain, which they lost 0–4 and 0–3. The Liechtenstein national football team has traditionally been regarded as an easy target for any team drawn against them, a fact that served as the basis for a book about Liechtenstein's unsuccessful qualifying campaign for the 2002 World Cup by British author Charlie Connelly. In one surprising week during autumn 2004, however, the team managed a 2–2 draw with Portugal, which only a few months earlier had been the losing finalists in the European Championships. Four days later, the Liechtenstein team travelled to Luxembourg where they defeated the home team by 4 goals to 0 in a 2006 World Cup qualifying match. They are still considered by many to be an easier touch than most, however, they have been steadily improving over the last few years, and are now considered the best of the European "minnows". As an alpine country, the main opportunity for Liechtensteiners to excel is in winter sports such as downhill skiing: Hanni Wenzel won two gold medals in the 1980 Winter Olympics. With nine medals overall (all in alpine skiing), Liechtenstein has won more Olympic medals per capita than any other nation. The country's single ski area is Malbun. (1) Entirely on another continent but having socio-political connections with Europe. (2) Has significant territory in Asia.